"He's biting the daylights out of me and I'm thinking, 'I can't let him go. Not today ... I wasn't dying today.' "
A Georgia woman snapped this picture of a bobcat shortly before it attacked her on June 7, 2018. A 46-year-old woman strangled a rabid bobcat to death after the animal attacked her in her front yard in northeast Georgia. 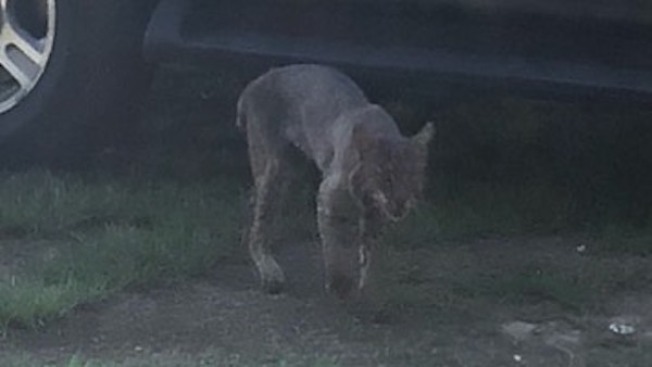 DeDe Phillips of Hart County went outside on June 7 to take a picture when the bobcat lunged at her, The Athens-Banner Herald reports. She then grabbed the cat by its throat and didn't let go. Phillips says she grew up in the country, where her father-in-law was once a trapper of bobcats. As a result, she knew something about the animal's behavior. Phillips says she was afraid of calling for help because her 5-year-old granddaughter was in the house. "My five-year old granddaughter was in the house and I didn't want her coming out," Phillips told NBC affiliate WXIA. "If she would have came out it would have killed her. But he's biting the daylights out of me and I'm thinking, 'I can't let him go. Not today ... I wasn't dying today.'" The woman is being treated for rabies and recovering from a broken finger and several bite and claw wounds to her hands, arms, chest and legs.